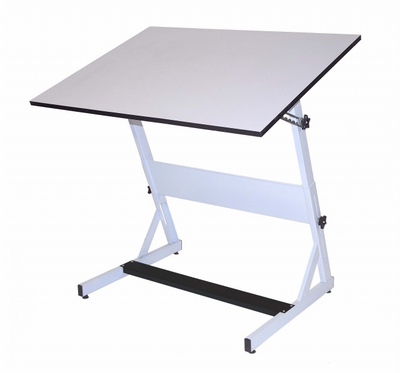 This heavy duty drawing table is fully adjustable to create a custom drawing experience in your studio. The MXZ Martin Drawing Table is the perfect studio solution for a sleek minimalistic style with maximum flexibility. Crafted from heavy gauge steel for durability in a suave contemporary design, this table is great for an open studio that accommodates many different artists in a single day. The table is fully adjustable in both tilt and height to make for a customized drawing experience. Equipped with a steel foot plate that is both durable and rigid, this table also features a rear-facing bookshelf upon which to display those little extras. Rubberized feet keep the table settled exactly where you want it; no slipping around slick floors. The drawing area top is sized in our most popular dimension; 30" x 40". The entire table is finished in white baked enamel so it will fit in with whatever your current studio decor may be! Please note that this item incurs an oversized shipping fee of: $83.40.